Do you have a tab problem? You are not alone. There is hardly anyone working with the Internet today, without a tab problem. Tab problem is part of the larger challenge of “information overload” for today’s information worker. Reasons are numerous, but simply put, you are swamped by interesting articles, insights and fun things on the internet, and you don’t want to lose them. Additionally, you need multiple tabs just to complete a single task. No longer do multiple tabs represent multi-tasking. Tab overload looks something like the picture below. With too many tabs open, its even hard to know which tab is what, because of the clutter! Besides cluttering your monitor, having multiple tabs open makes it hard to find the right tab when you need it, and jumping from tab to tab is hardly a productive activity. Plus, your browser will use up more memory, slowing down your computer and your work. 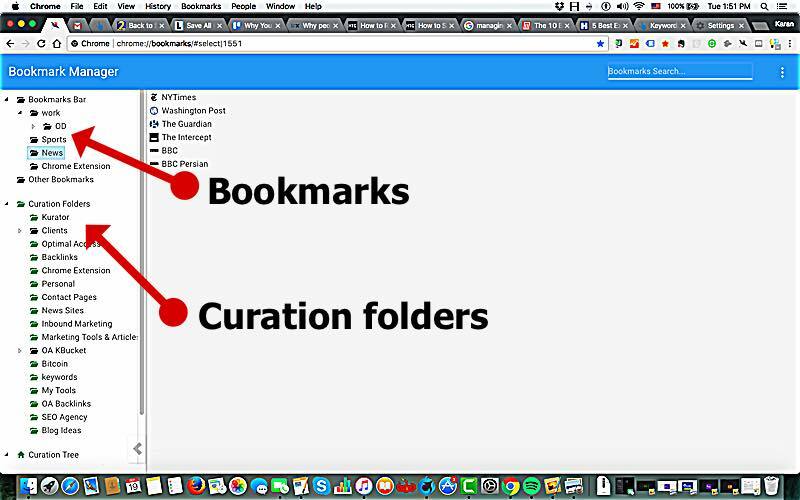 In this post, I will show you more efficient ways of managing your bookmarks and tabs with Kurator. I will discuss how to use Kurator to curate, export bookmarks, manage sessions, sync bookmarks and access them from any device. Kurator enhances your bookmark manager by adding “curation folders”. There is a big difference in storing “bookmarks” vs. “curating links”. Kurator’s big advantage is that it scrapes additional information from the page, that help us better manage our links! Here is a feature comparison between links stored with Chrome Bookmark Manager, vs. links stored with Kurator. Store Image URL no yes This is used when you publish the link online through KBucket pages. Store Link Description yes yes Either and excerpt from the article, or your own personal comments. Its critical as a curator to add your own brief for the articles you curate. Store Twitter handle no yes The author twitter handle is useful when you publish and share links from your KBucket pages. Kurator works more like a web clipper, allowing you to save all vital information, that makes finding and sharing that information easier. You can view your comments in a preview window, and sort and filter your links by date, publisher, author, content tags and your rating scheme. 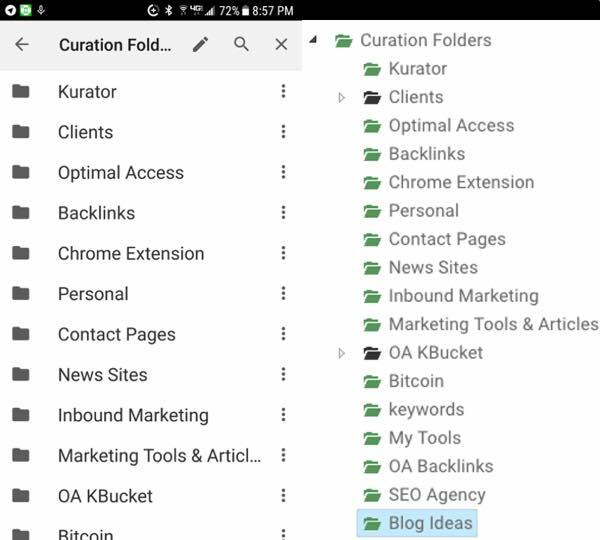 Curation folders can be pinned as tabs, so you can access all of your links under one tab! 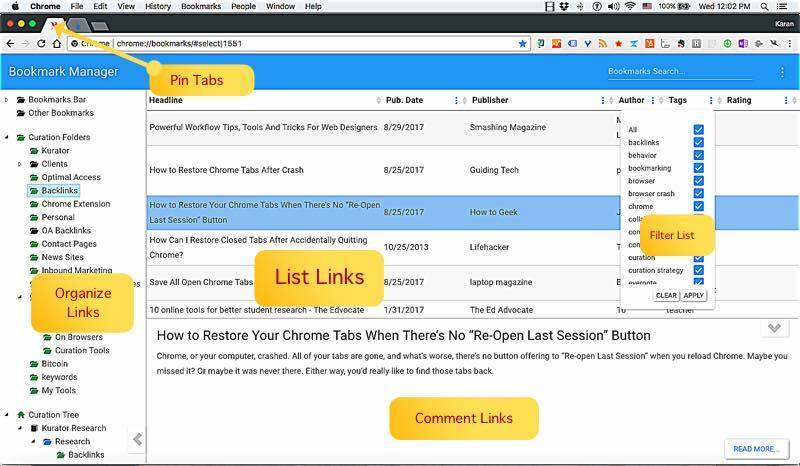 A session in browser terms is when you have a number of tabs open, related to the same project and you want to keep them together. In Chrome, you can save all of your open tabs to a folder. This is commonly known as saving your session. There is an extension called “session buddy” that will save and group your sessions. The limitation of “session buddy” is that it saves all open tabs to a folder. But you may not have a use for some of your tabs, so you either have to spend extra time getting rid of them, or they just add to your clutter! Chrome also lets you save all open tabs to a folder. 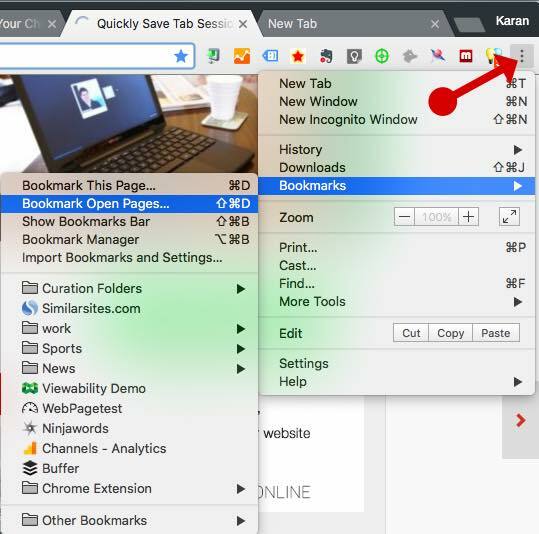 First, access the menu from the three-dots to the right of your address bar, or your Bookmarks menu. After you select the location, chrome will create a new folder and save all the links in that folder. If you have Kurator installed, you can also store your open tabs to a curation folder. The advantage of Kurator is that you can consciously organize and save your tabs as you work. 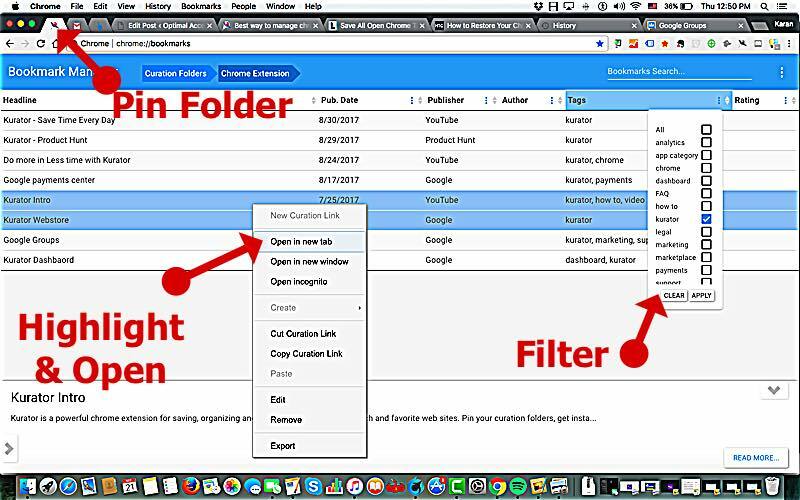 In this way, you will always have your tabs organized in separate folders the way you want them. 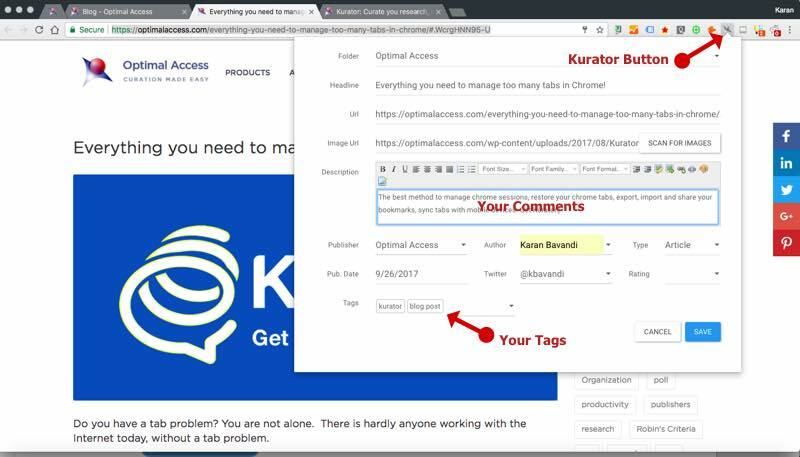 You can easily and quickly click on the “Kurator” icon in your toolbar, and the program will scrape the page and let you customize the comments and tags. As an example, I have a “Curation Folder” for saving all my links related to my Kurator project. I store them under the folder “Chrome Extension”. I have carefully tagged my links, so I can easily filter links, and highlight the links I want to work with. This is akin to session management. I have all of my research and chrome related project sites in one place., I can access links in specific folders based on the project I am currently working on. Furthermore, I can filter the links within each folder, based on the tasks I am currently working on. Most articles focus on restoring your chrome tabs, when you crash your computer. This is because all your tabs are lost, and restoring them takes time. Now, if you discipline yourself, to store your work sessions and favorite tabs, with Kurator, you will never worry about losing your tabs! 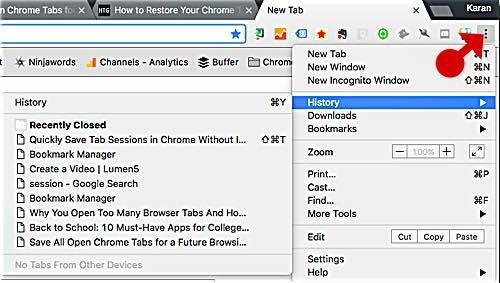 To restore tabs you haven’t saved, you need to access your History command from the menu in the top right of your toolbar. If you don’t see your tabs in the “recently closed” section, you should access the History page. With Kurator, you have more flexibility restoring your tabs! First, all your links are stored by session and category, the way you want them. This means you won’t be wasting any time finding the links you want to work with. 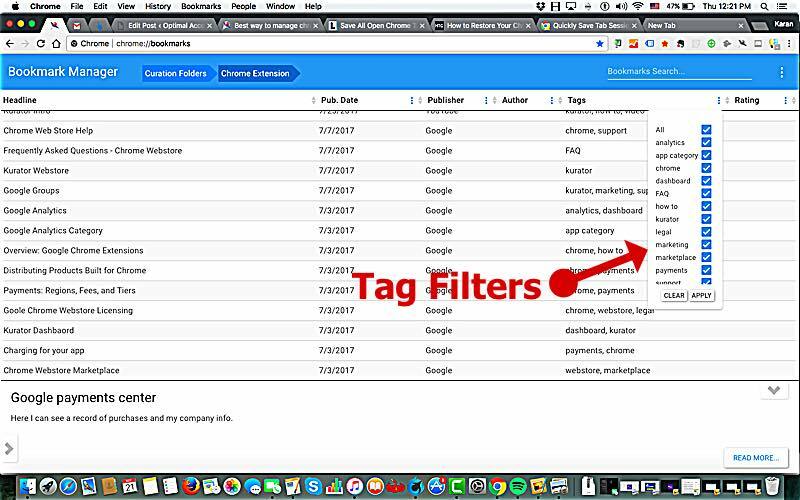 You can use filters to select the links you want to work with. You can then highlight the links you want to be opened and simply open them at once. If you Pin your curation folder, any link is always 2 or 3 clicks away! 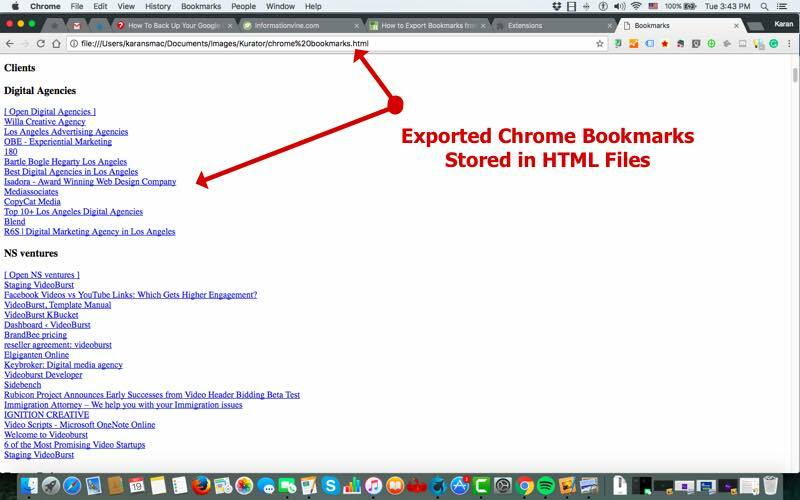 There is a number of reasons you may want to export your chrome bookmarks. If you want to use bookmarks between computers, or on your mobile device, simply enable the sync feature. From the hamburger menu (3 dots on the right), choose settings, make sure you are logged in and set your sync to on. But you also may want to backup your bookmarks or share them with your co-workers and clients. Here Kurator has a distinct advantage over Chrome Bookmark Manager. 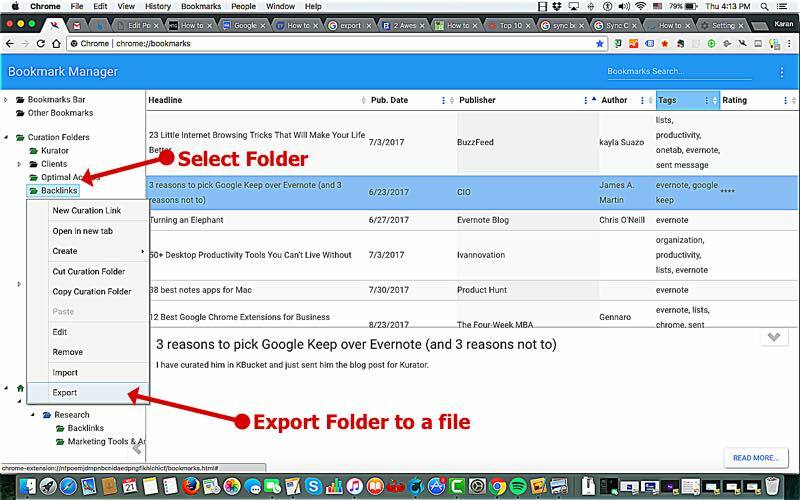 With Kurator you can export one or more folders and anyone with the extension can import the folders. Imagine you have done research on some topic related to work, found 10 or more articles or website and now want to share them. With Kurator, you are not only sharing the links but, you are also sharing your comments and tags. This makes it easy to collaborate on the list. Your co-worker can add, or modify the links and description and send the same folder back to you. When you import this folder, the new links will be appended to the existing links in your folder. To export, or import, you simply right click on the folder and choose the desired command. Compare this to the HTML file exported by the “Bookmark Manager”. Notice that there are no comments, and if the number of links you want to share reaches one hundred or more, it is very difficult to properly manage, access, or organize those links. Sync is a great feature of Google Chrome. When you turn sync on, you can access all your bookmarks and the “curation folder” links from your mobile device. You must be logged in to your Google account to setup sync. Access the settings tab from the menu in the top right, and then choose the advanced screen. Here you can decide all that you want to sync. 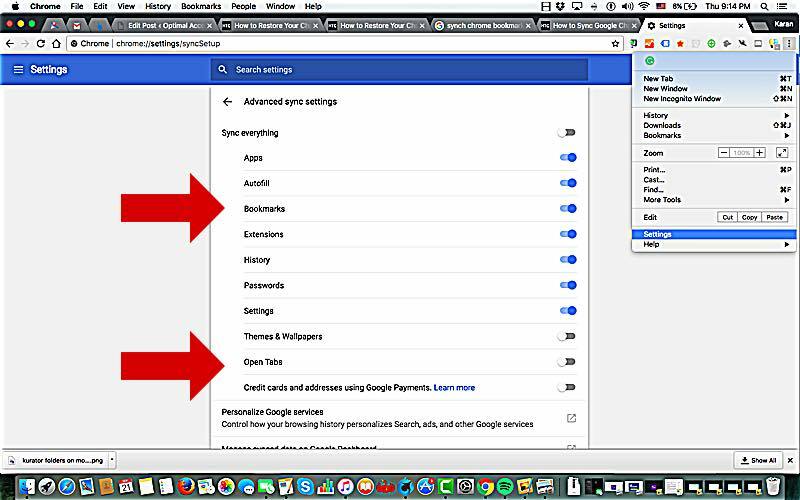 When you log into Chrome on your phone, go to the settings tab and make sure that sync is turned on. All “Curation Folders” are accessible from your Bookmarks Manager. Here is a side by side comparison, between my phone screen and desktop screen. On the phone, you do not get the descriptions and tags (yet)! The screen on the left is from my mobile android device. 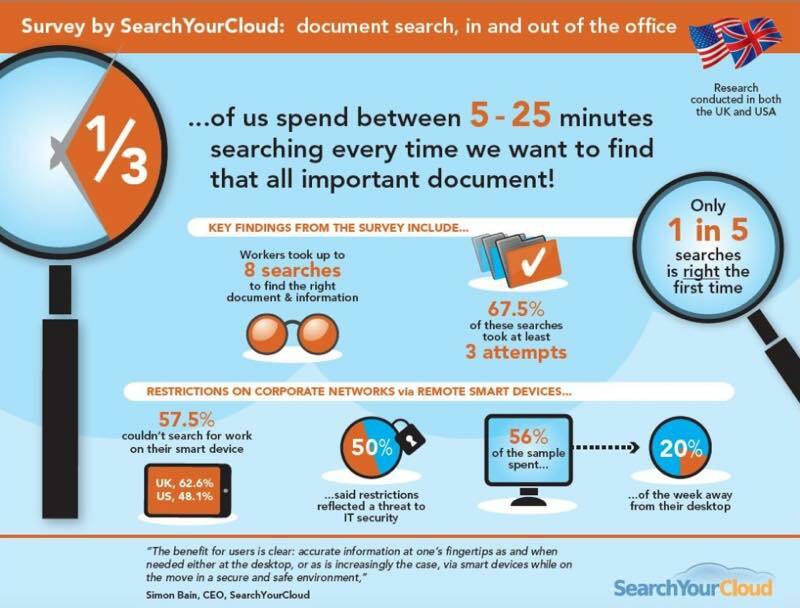 According to an excellent study by “Search Your Cloud“, it takes up to 8 attempts to find an accurate search result. In today’s work environment, documents are stored in the cloud, on the intranet, or somewhere on the Internet. This is exactly why we keep tabs open and are always concerned with restoring sessions or exporting bookmarks. Curation is the right solution for managing the challenge of information overflow and saving time looking for information. Kurator will not only help you save time on your own projects, but it also lets you publish your curated research online. Whether you are a researcher, journalist, content marketer, or you are looking for a curated enterprise search solution, we have a solution for you. Go here to get a detailed description of the application of our curated solutions for each market.